Stafford Loan Program: What Is the Max? The Federal Stafford Loan is the basic building block of most students’ financial aid packages. Students using Stafford Loans can typically borrow a significant amount of money regardless of their financial need, for both undergraduate and graduate school programs. The interest rate and terms for Stafford Loans can vary depending on whether the loans are subsidized or unsubsidized. However, in either scenario, they represent one of the best choices for borrowing to pay college costs. Stafford Loan limits are based on two factors: whether a student is considered a dependent of his parents and his year in school. Dependent students who were not able to secure a PLUS loan for additional funds can borrow money up to the independent student loan amount. Additionally, there is a lifetime limit on Stafford Loans, currently capped at $31,000 for dependent students, $57,500 for independent students, and $138,500 for graduate students. A subsidized Stafford Loan is one that the Federal government pays the interest on while a student is still in school. In other words, the loan value has nothing added to its original amount until after you graduate. Subsidized loans are available on the basis of financial need. Students who don’t qualify for a subsidized loan can still receive an unsubsidized loan but will accrue interest while they are still in school. However, they do not have to begin repaying the loan until after they graduate. The amounts of subsidized loans a student can receive are limited to the “dependent” maximums listed above. For example, the maximum subsidized loan amount for a freshman student would be $3,500. Any additional Stafford Loans received, up to the freshman year maximum of $9,500, would be unsubsidized. Graduate students are not eligible to receive subsidized loans. The current interest rate on all Stafford Loans issued on or after July 1, 2017, and prior to July 1, 2018, is 4.45%. In addition to the interest paid on a Stafford Loan, there is also a loan fee. For loans with a first dispersement date on or after Oct. 1, 2016, and before Oct. 1, 2017, the loan fee is 1.069% of the total loan amount. If on or after Oct. 1, 2017, and before Oct. 1, 2018, the fee is 1.066%. This fee is partially deducted from each disbursement check. During this six-month “grace period,” interest does not get added onto a subsidized loan, but does accrue for unsubsidized loan balances. Regardless of whether or not you are applying for a subsidized or unsubsidized Stafford Loan, you must fill out a FAFSA form. 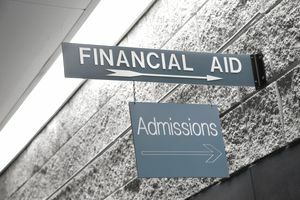 Once completed, the Free Application for Federal Student Aid (FAFSA) form is forwarded to your school, who will then inform you of your loan eligibility and lender options. When you accept the loan, you are required to sign a “master promissory note” before any funds can be disbursed. How Do School Loans Show up on Your Credit Report?